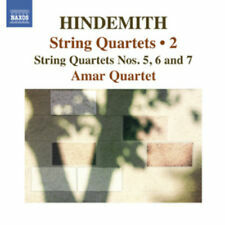 Amar Quartett, P. Hindemith - String Quartets Nos 5 & 6 & 7 [New CD]. Artist: Amar Quartett, P. Hindemith. It concludes one of the twentieth century's greatest cycles of quartets. Title: String Quartets Nos 5 & 6 & 7. Of Discs: 1 disc(s) Studio / Label: Naxos UK Release Date: 29 Oct 2012. Disc 1 10 Quiet. Scherzando 2.34 mins. Disc 1 11 Slow 6.02 mins. Disc 1 9 Fast 2.55 mins. Disc 1 8 Breit Und Energisch 6.28 mins. Title: Gilbert & Sullivan: Ruddigore. Artist: Isidore Godfrey. Format: CD. Condition: New. When the Night Wind Howls. Painted Emblems of a Race. Happily Coupled Are We. Hold, Bride and Bridegroom - Finale. Music For Harpsichord, Vol. 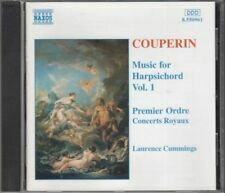 1 : Couperin. Benjamin Britten : Violin Concerto/cello Symphony CD (1999)Title: Violin Concerto/cello Symphony Artist: Benjamin Britten Genre: Classical|Classical Duration: 68 mins Format: CD / Album Type: CD No. of Discs: 1 disc(s) Studio / Label: Naxos UK Release Date: 01 Oct 1999. Ludwig van Beethoven : Piano Works Vol. 2 (Schnabel) CD (2002)Title: Piano Works Vol. of Discs: 1 disc(s) Studio / Label: Naxos Historical UK Release Date: 30 Sep 2002. Disc 1 14 Presto 2.07 mins. Disc 1 13 2. Artist: Vasily Petrenko. Title: Symphonies Nos 5 & 9. Format: CD. Condition: New. I. Allegro. Allegro Non Troppo. This item is the CD album of Rubbra - String Quartets 1, 3 & 4 as recorded by the Maggini Quartet. It was released on Naxos Record in 2011. Title: String Quartets 7. STR QT in F, H.34 (Transcription of Pno Son in E, Op.14, No.1): Allegretto. STR QT in F, H.34 (Transcription of Pno Son in E, Op.14, No.1): Allegro Moderato. STR QT in F, H.34 (Transcription of Pno Son in E, Op.14, No.1): Allegro. Concerto Brasileiro explores lyricism and modernity through solemn chorale-like writing and seductive dances laced with Brazilian folk rhythms. Chamber Symphony No. 2 explores and celebrates New York's rich cultural diversity. Cinema Classics 4 CD (1999)Title: Cinema Classics 4 Genre: Classical|Compilation Format: CD / Album Type: CD No. of Discs: 1 disc(s) Studio / Label: Naxos UK Release Date: 01 Jan 1999. 1 9 Bolero: (10). His earlier works are more accessible than challenging, as demonstrated by the relaxed and affirmative Second and Third Quartets. All four musicians play in the internationally renowned Swedish Chamber Orchestra. Title: British Violin Concertos. Format: CD. Item Condition: New and unplayed. Artist: Donna Amato. Title: Piano Sonatas 3 & 4. Format: CD. Condition: New. Cello Recital CD (2002)Title: Cello Recital Genre: Classical|Virtuoso Format: CD / Album Type: CD No. of Discs: 1 disc(s) Studio / Label: Naxos UK Release Date: 29 Apr 2002. 1 2 Sonata in C for cello and piano - Britten. Prelude No. 1. Prelude No. 2: Vivo. Prelude No. 3. Prelude No. 4. Prelude No. 5: Pesante. Prelude No. 6: Molto vivo. Prelude No. 7: Moderato - Molto vivo. Prelude No. 8. Artist: Moyzes. Record Label: Naxos Alexander Moyzes was among the leading Slovak composers of his generation, drawing inspiration from the traditions and landscape of his own country while absorbing a number of wider contemporary trends. Of Discs: 1 disc(s) Studio / Label: Naxos UK Release Date: 12 Aug 2016. Disc 1 16 Fugue in E Minor 3.18 mins. Disc 1 15 Fantaisie in B Minor, Op. 28 10.19 mins. Disc 1 14 Waltz in G-sharp Minor, Op. Disc 1 13 No. 2 in F-sharp Minor 4.17 mins. Artist: S. Prokofiev. Title: Works for Cello & Orchestra. Format: CD. Release Date: 1997. Item Condition: New and unplayed. Allegro Giusto. Votre Toast (Toreador Song). Title: Best of Opera 1 / Various. Artist: Various Artists. Format: CD. Condition: New. Der Holle Rache (Aria of the Queen of the Night). Overture to the Force of Destiny. Va, Pensiero (Chorus of the Hebrew Slaves). Title: Gottschalk - Piano Works. Title : Gottschalk - Piano Works. Creator : Louis Moreau Gottschalk, Cécile. Format: Live. Format : Live. Product Category : Music. Release Date : 2003-03-31. Condition : Good. Diwan CD (2003) NEW Title: Diwan Genre: World Music|North African Duration: 55.40 mins Format: CD / Album Type: CD No. of Discs: 1 disc(s) Studio / Label: Naxos World UK Release Date: 28 Jul 2003. Title: Symphony 1 / Violin Concerto. Format: CD. Item Condition: New and unplayed. Artist: A. Glazunov. Title: Piano Concertos 1 & 2. Format: CD. Item Condition: New and unplayed. Release Date: 2000. 1 8 Nocturno For Solo Piano. 1 9 Serenata Andaluza For Solo Piano. 1 14 Pour Le Tombeau De Paul Dukas For Solo Piano. 1 18 March Of The Dwarves For Solo Piano. 1 19 Vals-Capricho For Solo Piano. 1 25 V. Venga La Bota (Drinking Song). Artist: Scott Joplin. Title: Piano Rags. Format: CD. Condition: New. Original Rag. Fig Leaf 'A High Class Rag'. Genre: Classical Composers. Elite Syncopations. In very good condition - light wear. Artist: Oslo String Quartet. Title: String Quartets. Un Poco Andante - Allegro Molto Ed Agitato. Sostenuto - Allegro Vivace. Allegro Scherzando. Agitato - Allegro. Allegro Vivace. The Fifth was composed in the Egyptian temple town of Luxor, and displays a rich tapestry of exotic cultural influences from Japanese, Spanish, and Middle Eastern music, as well as portrayals of chirping Nile crickets and croacking frogs, and the composer's representation of 'the joy of a sea crossing.'. Classical 2 CD - Phillips - Dvorak - Symphonies 7,8 & 9. Dvorak symphonies No 7, 8 & 9. Classical music CD (2 CDs). Title Beethoven: Symphonies Nos. 4 & 7 Release Date 1999-07-26 Label: EMI Records Number of Discs 1 Info: Richard Edlinger,Zagreb Philharmonic. Artist: S. Rachmaninoff. Title: Symphony 2. Format: CD. Item Condition: New and unplayed. Genre: Classical Composers. Title: Complete Piano Music 8. Format: CD. Title: Piano Sonatas 23. Format: CD. Item Condition: New and unplayed. 5-Complete Songs - P.I. Tchaikovsky (CD New). 6 Romances, Op. 38: No. 5. Format: CD. 6 Romances, Op. 16: No. 6. Novogre Heskaya Pesnya (New Greek Song). Hamlet, Op. 67a (Excerpts). 6 Romances, Op. 28: No. 1. Moods - Serenade CD (1999) NEW Title: Moods - Serenade Genre: Classical|Classical Format: CD / Album Type: CD No. of Discs: 1 disc(s) Studio / Label: Naxos UK Release Date: 01 Feb 1999. 1 3 Larghetto - Capella Istropolitana. Title: String Quartets Nos. 1 & 2. Artist: Aviv Quartet. Allegretto Con Moto E Con Malinconia Grotesca. Finale: Andante Quasi Introduzione - Allegro Molto. Andante Molto Sostenuto. Allegro Giocoso Alla Slovacca. Piano Works Vol. 3: Sonatas Nos. 7, 8, 9 and 10 (Schnabel) CD (2002)Title: Piano Works Vol. of Discs: 1 disc(s) Studio / Label: Naxos Historical UK Release Date: 02 Dec 2002. Title: Concerto for Piano & Orchestra. Format: CD. Item Condition: New and unplayed. Title: Music for Chamber Orchestra. Genre: Classical Artists. Format: CD. Artist: Ariadne Daskalakis. Title: Complete Violin Sonatas. Handel' violin sonatas have been staples of the repertoire for generations, but there has been considerable confusion about their authenticity.